I never cease to be amazed at the serendipitous way in which a delicious recipe can come together. Case in point: Recently, while purchasing dried pasta at the grocery store, I grabbed a box of no-boil lasagne noodles. I was thinking about the beautiful Swiss chard I had at home and how it might be nice tucked into a lasagne. I didn't really have any specific ideas, other than I knew I had some ricotta in my fridge and consequently a beginning. It wasn’t until I got home that I began to think about what else might be good. Tomato sauce is an obvious choice...but the tomatoes really hadn't started to come into their own yet and the few that I had, I wanted to eat raw. I did have a lot of fresh sweet corn (which is delicious with chard)...but this didn't solve my problem of a sauce... A béchamel would have worked...but I didn't want anything quite so heavy. As it happened, my summer Corn & Zucchini class was approaching and the things that I teach in that class were in the forefront of my mind. One of the recipes is for a delicious corn pesto. It occurred to me that the corn pesto would make a pretty fine sauce-y component. Suddenly, the lasagne fell into place: Corn pesto, chard (braised with a little onion and garlic), ricotta, more corn... Italian sausage (I almost always have some in my freezer...and I knew that its salty-sweetness would be just the thing)... and finally, some low-moisture mozzarella that I happened to have in my cheese drawer. If I had been purchasing cheese with the purpose of this lasagne in mind, I would have gravitated towards Fontal. But the mild, faintly sweet, taste of the mozzarella turned out to be the perfect finishing touch. If you keep regular lasagne (the kind you boil before using) on hand, I'm sure you could boil them and use them instead of the no-boil noodles in this lasagne. But if you have never tried no-boil noodles, you should. For one thing, no-boil noodles tend to be thinner than regular lasagne. This makes for a finished pan of lasagne that is a bit more refined. 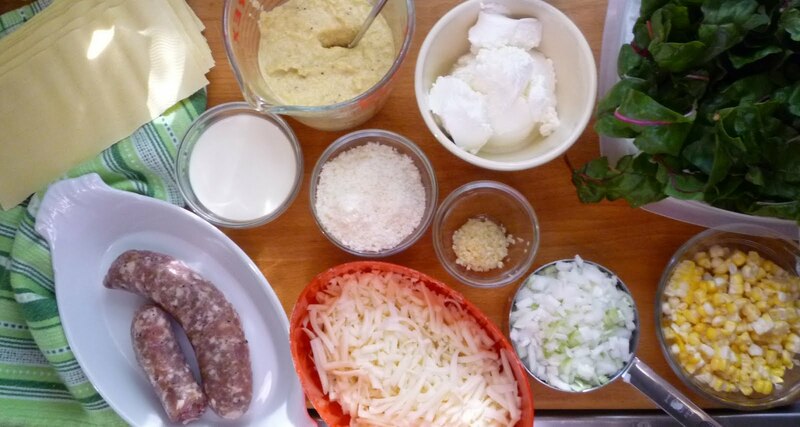 Furthermore, no matter how you make it, building lasagne is a project. No-boil noodles relieve you of at least some of the work and the mess. I like to dip the no-boil noodles into hot water (in a shallow pan, just off the boil) for a few seconds while I'm building each layer. (It is not necessary to spread them on towels or dry them.) The quick dip in hot water will help them begin to soften and add the very small amount of moisture they will need to give them a nice tender—but not mushy—texture in the finished dish. 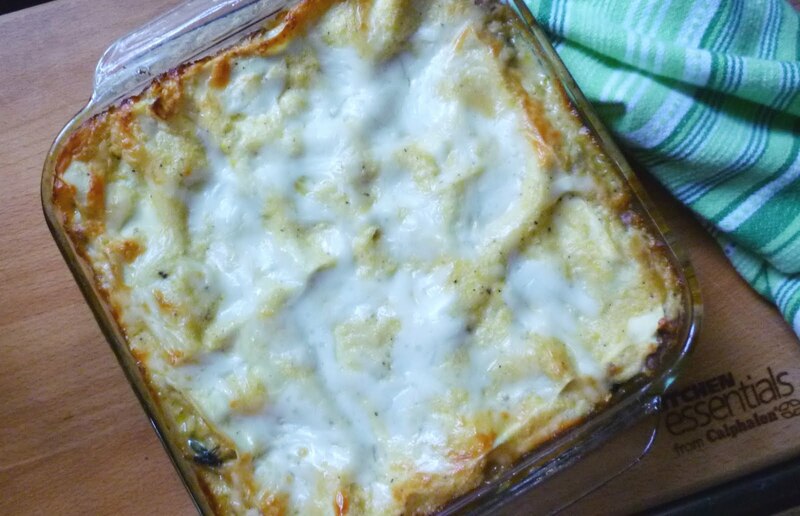 If you cover the baking lasagne with foil until the last 10 to 15 minutes of baking time, the noodles will become evenly hydrated, without drying out on the edges. 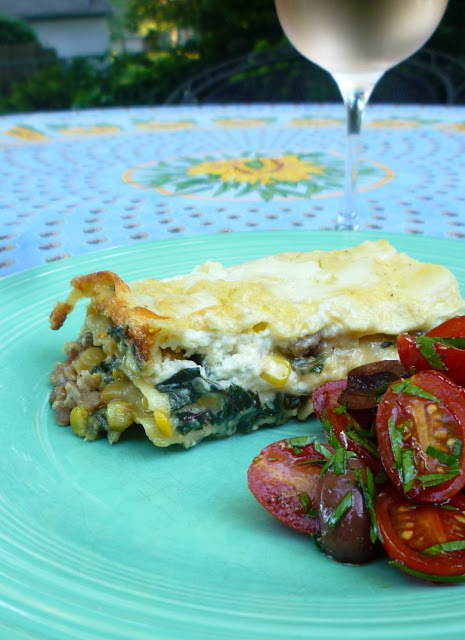 To make the lasagne, you will need 1 1/4 cups of roasted corn for the pesto and 1 cup to tuck into the lasagne. This latter amount is an approximation.... 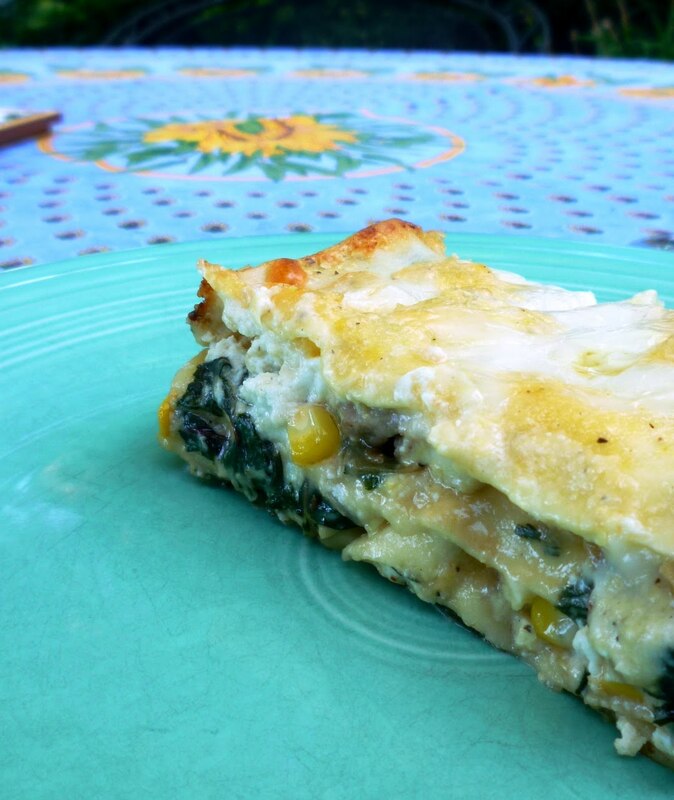 I roast 2 to 3 ears of corn—depending on their size—make the pesto, and then add the remaining kernels to the lasagne. If you have already made the pesto and don't want to roast more corn, simply add raw corn kernels to the onion and chard mixture in place of roasted corn. If you have never roasted corn in the husk, check out my post from a few years back for a description of how it's done. As you look at this lasagne, you may think that it doesn't seem like a very large lasagne...but I think you will find that it is pretty rich. Depending on what else you might be serving, you could get as many as 6 servings out of it. I confess that the first time I made it, I didn't serve anything else and I ate a quarter of the pan. On other occasions—with a side vegetable...or a fresh tomato salad—I have been content with a sixth. If you are feeding a crowd of big eaters, you could make two pans (or in one big pan if you happen to have a 4 1/2-quart shallow, rectangular dish—like a 15- by 9- inch Pyrex). The leftovers reheat beautifully, so you may want to make a double batch no matter how many you are feeding, just so you can have another serving all to yourself for lunch the next day. Place a tablespoon of oil in a wide sauté pan and crumble in the Italian sausage. Place the pan over moderate heat and cook until the sausage is cooked through (no longer pink). Remove the sausage to a plate. If the sausage was very lean, add more oil to the pan. Add the onion, along with a good pinch of salt and sweat until very tender and beginning to caramelize on the edges—about 10 to 15 minutes (adding more oil if the onions seem dry). Add the corn—along with a pinch of salt—to the pan and cook until it is sizzling and hot through...5 minutes or so. Add the garlic and cook just until fragrant—less than a minute. Begin adding the chard to the pan a handful at a time, turning it to coat in the oil and vegetables and adding successive handfuls as the previous handful begins to collapse. (If the chard was just washed, it will still have water clinging to it that will help it to collapse. If it was washed ahead, it may be dry...in which case you may need to add a quarter cup or so of water to the pan to create some steam to help the chard wilt.) When all the chard has been added, cover the pan and cook over low heat until the chard is just tender (about 10 minutes). Uncover and continue to cook until all the liquid has evaporated (the ingredients will begin to sizzle in the fat) and the chard is very tender. Taste and correct the seasoning with salt and pepper. While the chard cooks, combine the ricotta and Parmesan in a small bowl. Add salt & pepper to taste and blend well. Set aside. In another small bowl, combine the pesto and cream. Taste and correct the seasoning. Set aside. Lift the noodles out of the pan. (They should not be soft or flexible at this point...you're just giving them a head start by soaking them briefly—less than a minute.) Let the excess water drip back in to the pan and arrange them in a single layer in the prepared baking dish. Add a couple more noodles to the pan of hot water (to soak while you build the first layer). 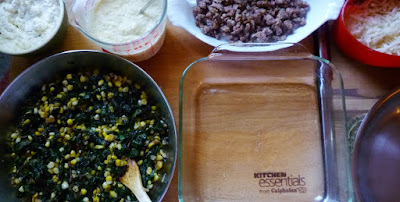 Spread a third of the chard/corn mixture over the noodles in the lasagne pan. Scatter a third of the sausage over the chard. Daub a third of the ricotta over everything. Spread a third cup of the pesto over the ricotta (they will marble together a bit...this is fine). Finally, add an ounce or so (about 1/4 cup) of the grated mozzarella. and a scattering of the remaining mozzarella (about 2 oz.). Cover the pan with a piece of aluminum foil that has been brushed on the underside with olive oil (or sprayed with pan spray), tenting the foil slightly if possible so that it isn't touching the top of the lasagne. Bake in a 375° oven until the mozzarella on top has just melted—about 20 to 25 minutes. Uncover and continue to bake until the lasagne is bubbling around the edges and a skewer inserted in the center is hot (160° to 180°). If the top is not browned to your liking, briefly run the lasagne under the broiler. Let the lasagne rest for 10 to 15 minutes. Cut with a sharp knife and serve. 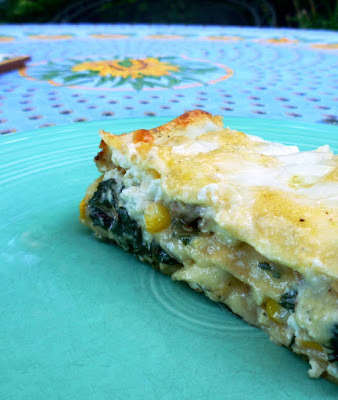 Serves 4 to 6.
i made a swiss chard lasagna a couple years ago and it was very healthy tasting (despite all the cheese and carbs involved). this one sounds so much lighter + tastier (corn pesto?! yes please!). Hi Heather, Thanks for taking a minute to comment. I do hope you enjoy this lasagne. I would love to hear back from you when you try it. Thanks!